Mary Blair is the woman responsible for the design in some of Disney's early, dreamy full length feature cartoons. Alice in Wonderland, Peter Pan, Cinderella and Sleeping Beauty...Mary Blair did concept art for all of these movies. Its a Small World was entirely designed by Mary Blair. Even if you aren't a huge fan of the ride, you have to admit that the concept art and the ride's design are absolutely fantastic. One day perhaps I will be able to afford some original Mary Blair concept art, until then I will be content with coffee table and Children's books: The Art and Flair of Mary Blair, Cinderella, I can Fly, or Alice in Wonderland. 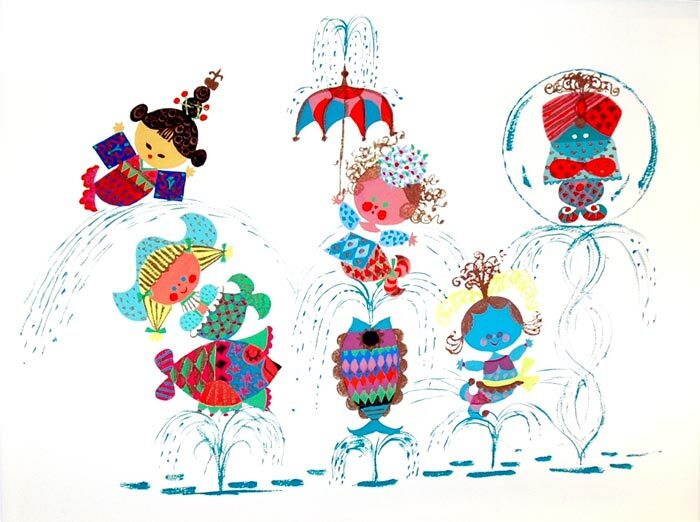 Alternatively, I could spend hours perusing the Mary Blair flickr photo set or watching fabulous Disney movies. I love Mary Blair! There was an exhibit of her work at the San Francisco Cartoon Museum earlier this year... I love how Mid-Century her style is, but actually a lot darker than at a simple first glance. Her landscapes are so cool too! I just bought the Art and Flair book for my sister for her b-day...because I like to give what I'd like to get! I also put this book as a suggestion on my "Everyone's Mad" post a few weeks ago...great style! I remember as a kid going to Walt Disney World staying in the Contemporary Hotel. There's a giant Mary Blair mural in the lobby. It's still there. Sadly, some of Mary's work has been painted over or destroyed at some of the Disney Parks. There's a great blog about the history of the Disney Parks called "Re-Imagineering". They did a story about the history of Mary Blair and her work. I'm glad Mary's work is being re-discovered by a new generation of artists. I grew up in Orlando, my love of all things Disney runs deep. I am especially in love with Mary Blair. Love Mary Blair arts...She did a wonderful job...very talented. I am glad that they are reconizing her arts and recovery it. Thanks for stopping by and sweet note. You have a wonderful week.. ~Katherinellen~.